With four cats, it can be difficult to manage their litterboxes sometimes. I’ll admit, I’ve sometimes asked myself, “When was the last time I cleaned the litterboxes?” only to realize it had been over a week. Luckily, my cats are pretty forgiving and don’t mind a smelly box. Other cats may be more finicky, and when new cat owners don’t know much about their cat’s “waste management,” it may result in kitty accidents and unhappy owners. Here are a few common questions and answers about litterboxes to help you maintain a happy cat-human relationship and a pleasant-smelling home. 1) How many litterboxes do I need? The general rule of thumb is about one box per cat and one box per story. Example: in a two-story house with two cats, it’s best to have one litterbox upstairs and one downstairs. In a one-story house with three cats, you could place two or three litterboxes next to each other so there’s always an open “stall,” or have one or two boxes at each end of the house so your cats won’t disturb each other. 2) What kind of litterbox is best? It depends on the cat. Hooded ones leave less mess, but some cats refuse to use them. A large breed or overweight cat might need a bigger litterbox, and messy kickers might do well with a taller box and just a thin layer of litter. Kittens can have trouble getting into a tall or hooded box, so they might need a smaller one while they’re still growing. If you’re not sure which kind your feline prefers, try a few kinds so he’ll have options. 3) What kind of litter should I get? Try different kinds until you find one that works for you. You may find clay litter is too difficult to clean, or clumping doesn’t always clump like it’s supposed to, or those really expensive kinds are the ones your cats won’t even go near. At our local shelter, they use litter pellets because they’re less messy. At home, I use clumping litter designed for multi-cat households. The amount of litter also matters; some cats like to feel the box as they dig, but with multiple cats having more litter helps reduce the smell. 4) How often should I clean the boxes? 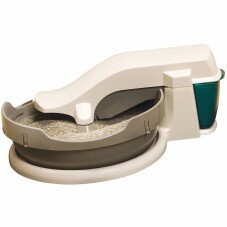 The Simply Clean® is a self-cleaning litter box system that makes it easy to keep you and your cat happy. A few times a week, depending on how many cats you have. With one cat and one litterbox, you could probably get away with cleaning it two to three times a week. With four cats and three litterboxes, scooping them every other day would be best. Your cats might tell you it’s too dirty by leaving “presents” around the house (the bathtub, corners of rooms, and dirty laundry on the floor are some places to watch). 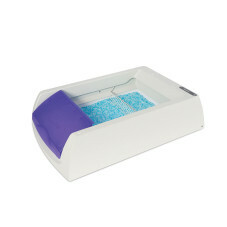 If you have trouble remembering to clean the litterbox, a self-cleaning or automatic litterbox could be a great solution. 5) What if my cat stops using the litterbox? Have I changed the litter, box, or placement recently? 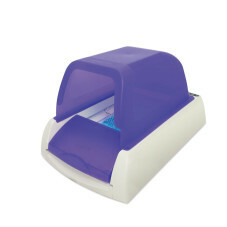 Maybe your cat couldn’t find the litterbox or doesn’t like the smell of the new litter. Is there some new stress in my cat’s life, like a new pet or different work schedules? Some cats react to stress by refusing to use the litterbox. Give them time and they should adjust eventually. Is my cat showing symptoms of a urinary problem? Talk to your vet about this possibility if you notice other symptoms such as difficulty urinating, excessive grooming of the area, or urinating on smooth surfaces. Urinary issues are easy to treat but can become very serious if not diagnosed quickly. How do you handle your cat’s litter situation? Do you have any other tips for new pet owners? ABOUT ROSLYN At PetSafe® Brand's Knoxville headquarters, Roslyn McKenna is the Web Content Specialist. Roslyn comes from a family of animal lovers and has a B.A. in Writing/Communications from Maryville College. She has volunteered with various animal rescues in Tennessee and South Carolina. Roslyn currently shares her home with four cats.